Videocon D2H DTH planning to add 50 HD TV channels and Videocon D2H added TLC HD in satellite TV bouquet. 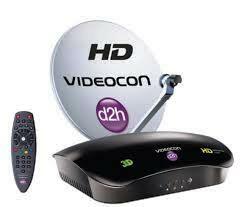 DTH service provider Videocon D2H has strengthened its bouquet of HD channels and HD services. With the addition of TLC HD channel, Videocon D2H now has 35 HD channels and HD services. Videocon D2H continue to expand its portfolio of HD channels. The company is planning to soon offer 50 channels and HD services. Videocon D2H CEO Saurabh Dhoot said. "The rich video quality of HD channels makes watching a treat and our honest to give maximum effort on HD TV viewing experience in India is set for an update and Videocon D2H is ready for it, with its innovative technology and quality services. " CEO d2h Videocon Anil Khera said: "d2h Videocon believes in offering its customers the content more premium with 35 channels and HD services, we are working to deliver more than expected Our subscribers can enjoy a wide range of channels.. HD various genres such as sports, movies, entertainment, information and entertainment and music. This promise to give the best channels and services across genres has built confidence Videocon D2H. " Indian direct-to-home (DTH) satellite platform Videocon D2H has increased its offer High Definition (HD) channel 35 channels with the introduction of TLC HD. The channel, previously known as Discovery Travel & Living India, has two original productions and imported programs covering health, cooking and travel. Their diet HD was launched in June 2014. Among the 35 HD channels, TLC HD in d2h DTH joins first 4K Ultra HD channel of India on the satellite TV platform. "We at Videocon D2H We believe in giving our viewers the best quality content to transform your television viewing experience. The rich video quality of HD channels makes watching a treat, and it is our honest effort to provide maximum HD. The experience of watching TV in India is set for an update, and Videocon D2H is ready for it, with its innovative technology and quality services, "said Saurabh Dhoot, CEO, Videocon D2H. Anil Khera, CEO, Videocon D2H, added: "d2h Videocon believes in offering our customers the content highest quality, with 35 channels and HD services, we are working to deliver more than expected Our subscribers can enjoy a wide range of high. definition channels of various genres such as sports, movies, entertainment, information and entertainment and music. This promise to give the best channels and services across genres has built confidence Videocon D2H. "